Hundreds of Egyptians demonstrated in Cairo to press for the army to assume power in a country plagued by unrest and instability. Hundreds of Egyptians demonstrated in Cairo on Friday to press for the army to assume power in a country plagued by unrest and instability two years after a revolution which toppled president Hosni Mubarak. 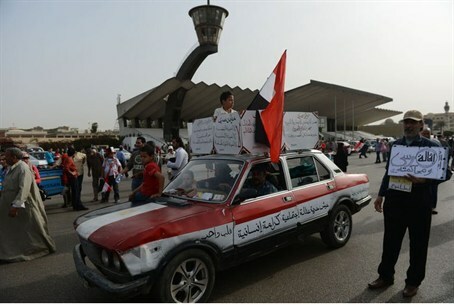 According to a report in AFP, the protest was held in eastern Cairo in response to a call by retired army officers and groups opposed to the Muslim Brotherhood, the party of President Mohammed Morsi. "The army must return" to power and "Down with the power of the guide," they chanted, referring to the Brotherhood's spiritual guide Mohamed Badie, as they waved portraits of General Abdel Fattah al-Sissi, the armed forces chief. Al-Ahram newspaper's website reported that pro-army demonstrations were also held in Damietta in northern Egypt. In late January, Sissi warned that Egypt's political crisis could lead to the collapse of the state, something which the military which ruled the country between the fall of Mubarak and last June's election of Morsi would not allow. Opposition groups and disgruntled Egyptians accuse Morsi, the Muslim Brotherhood and other Islamists of monopolising power, and say the revolution failed to reach its goals of social justice. The gulf between the ruling Islamists and the opposition has been growing wider since November when Morsi issued a decree expanding his powers. Earlier this week a legal body representing Morsi filed an appeal against a court ruling cancelling the country’s controversial parliamentary polls. On March 6, a lower court ordered the cancellation of the April 22 parliamentary elections because Morsi had ratified a new electoral law without sending it to the top court, as required by the constitution.